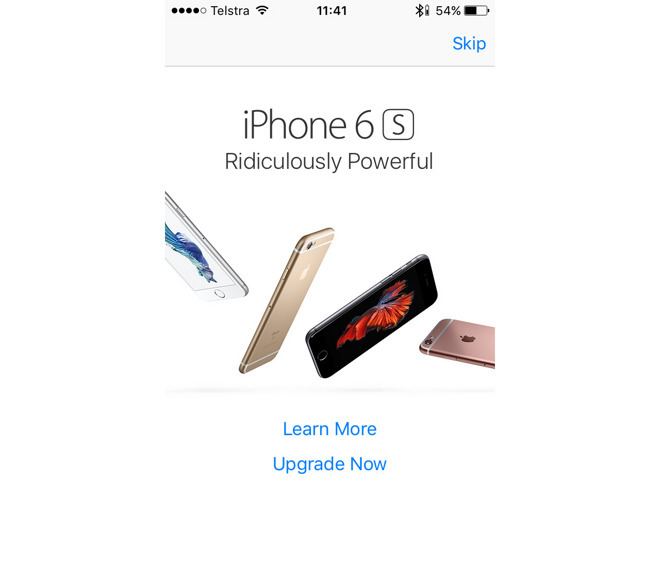 Apple is beginning to push fullscreen pop-up ads for the iPhone 6s to people opening the App Store app on some older iPhone models, according to a rush of user complaints. The ad presents a graphic with the slogan "ridiculously powerful," and highlighted options to "learn more" or "upgrade now," according to posts on sites like Twitter and Reddit. An option to skip to the regular App Store interface is found in the upper-right corner of the screen. The pop-ups appear to be targeted at people using an iPhone 5s or earlier, and may have been enabled with Tuesday's release of iOS 9.2. Apple has previously marketed new devices through things like App Store banners and collections, but this is the first time Apple has temporarily prevented people from using an app simply for the sake of marketing —at least when excluding the Apple Music sign-up screen seen after launching the iOS Music app for the first time. Such ads are relatively common in third-party apps. Apple is presumably eager to fuel iPhone sales during the winter holidays, since the device is its most important product and the holidays its most lucrative sales season.